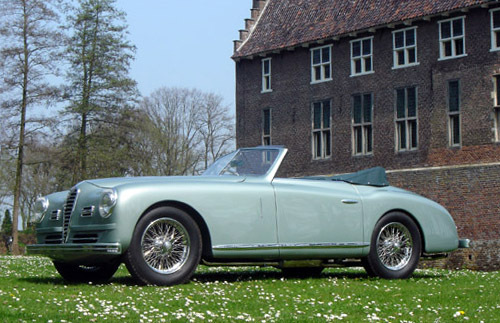 Today's gallery pick is this beautiful Alfa Romeo 6C 2500 SS Cabriolet by Pinin Farina. The owner of this soft green-grey-ish metallic example sent us a very nice set of pictures and we just felt the need to share these with you. Enjoy! The Alfa Romeo 6C 2500 was one of the first postwar models produced by this Italian manufacturer during the years 1947 to 1952. By 1947, Alfa Romeo had dug out from the rubble left by the Allied bombing of its factory in Milan and resumed production with the Tipo 6C 2500. This dohc six-cylinder design was essentially an evolution of the prewar 6C 2300 and 2500. Alfa Romeo had built some special versions of the 6C during the war, though. A number of six to be precise. All of these were unique. The 6C 2500 was the last Alfa Romeo built with separate frame and body, thus Alfa's last coachbuilt car. While Alfa Romeo manufactured their own sedan bodies for the lower-end versions, for the Super Sports cars they supplied the engine, drive-train and chassis to a "carrozzeria". The finest coachbuilders in Italy built bodies for the 6C 2500 models, including Pinin Farina, Stabilimenti Farina, Touring, Ghia, Bertone, Michelotti, Boneschi and others. The Pinin Farina bodied cabriolet with its two-part windscreen fulfilled the customer's desires, but cost a veritable fortune. It was one of the most expensive series produced cars of its time. The 6C 2500 Super Sport is the ultimate variant of the old style elegant, glamorous, and luxurious Alfa Romeos that were developed under the guidance of Vittorio Jano and Wifredo Ricart. The Super Sport chassis was 2.7 meters long, 0.3 meters shorter than the Sport chassis. The engine of the SS was similar to the Sport version, but the compression of the six cylinder engine was increased. Sedate rather than sporting, the 6C 2500 SS is the last remnant of the era of the great Alfa Romeos. The International Register of the Alfa Romeo 6C 2500 indicates that only 63 6C 2500 SS two-seat, short wheelbase cabriolets were made during the postwar period. About 25 to 30 received this kind of body style by Pininfarina. Those who are accustomed to speak about coachbuilt cars in terms of "unique one-offs" or "highly limited series", may call this 2500 SS a series produced car, but it is still a very rare find. Have a look at more pictures of this beauty and some of her sisters in the gallery.